1. Analyze and interpret data for patterns in the fossil record that document the existence, diversity, extinction, and change of life forms throughout the history of life on Earth under the assumption that natural laws operate today as in the past. On page 58 of your notebooks make a new unit tab and label it Natural Selection. Answer the GQ on page 59 in your notebook. 1. How did life on Earth begin? When? 2. How many species of plants, animals, fungi, bacteria, etc. do you think live on earth now? 4. How do we know that life has evolved on Earth? Step 1: Pick up a pre-assessment from the folders. Complete on page 60 in your notebooks and then pick up a key to self assess. Each multiple choice question is worth 1 point for a total of 21 points. Self assess. Step 2: Watch the video Tree of Life and then complete the History of Life web-quest below. Use the key to self assess and paste onto page 61 in your notebooks. Step 3: Pick up a History of Life Webquest and complete using the link to the right. 1. Investigate the principles of natural selection based on Darwin's expedition on the HMS Beagle. 1. After watching the Tree of Life, who did you determine was all of life's common ancestor? 2. How many different species of living things exist today? 2. In your own words, explain how you think natural selection has helped to develop the many types of plants and animals. Step 1: You will be investigating Darwin's voyage on the HMS Beagle. Watch the video to the right and then pick up a packet titled Darwin's Voyage of Discovery Activity 3. There are 3 table papers you will need: instructions, questions, and the reading. You will also need to pick up your student sheets of the map and the logs that you will fill out and turn in. Follow the directions to fill out the log, complete the map and then answer the questions on a seperate sheet of paper. Turn these in for a grade. You may work in groups of 2. When you get these back they will be pasted onto page 63. Step 2: Play Darwin's survival game below as an extension of this activity. 1. Investigate the mechanism that guides natural selection by simulating different types of birds and their beaks and how they are "selected" to eat different prey. 1. 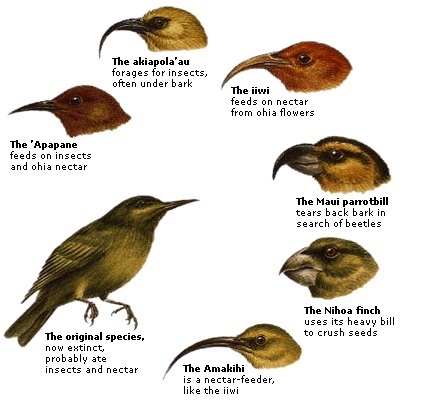 What did Darwin determine was the result of the different sizes of beaks in the finches he observed in the Galapogos Islands? 2. For what reason do animals overproduce? 3. Give an example of an adaptation that an organism may posess and give a reason that it has helped their species to survive. Step 1: Grab the Bird Beak Lab Table Papers and the Bird Beak Lab Student Data Tables & Questions. Read the background information and follow the directions to perform the lab. Grab the supplies from the teacher and complete each round. Fill out the data tables as you go. 1. Use the taxonomy of living things to understand how all living things are classified and related. 2. Investigate the taxonomy of an organism. Step 1: Pick up an Investigating Adaptations Under the Microscope Activity sheet. Follow the directions on the sheet and complete the front page. When using the microscopes, return the slides to their original container and be sure to turn off the microscopes. Step 2: On the back of your sheet you will be filling out criteria for Kingdom and phylum, the different classifications of living things. Watch the video to the right about the Six Kingdoms of Classification and fill in the data table. Step 3: Use the webpage, Phyla: The Shape of Life to investigate the 8 different types of Phyla. Fill out data table on your sheet using the webpage and the table papers in the self paced folders. Use Arthropods as one type of Phyla. Then go back and label your microscope organism's kingdom and phyla. Self Assess using the key at the teacher's desk. Paste onto page 66. 1. What event first occurred in order for higher animals to develop vertebrates? 2. What was a second and third feature that helped animals to become more complex? 3. What are nature's most elaborate creations? 4. Which animal are humans most closely related? 5. What are some of our major differences? Check your answers with the teacher's notebook on the self paced table in the front of the room. 1. Create a cladogram that shows evolutionary relationships between organisms. Step 1: Pick up a Cladogram Analysis Activity 6 Worksheet from the folders. Read through the background and directions and complete. Paste onto page 68 in your notebooks and self assess it with the key at the teacher's desk. Step 2: Watch the video to the right on Cladograms. Step 3: Pick up a Making Cladograms Activity 7 table papers for background knowledge and student worksheets to complete. Follow the directions using the notes on the background knowledge and the internet to look up the shared derived characteristics and complete. Self assess using the key at the teacher's desk and paste onto page 69. 1.. 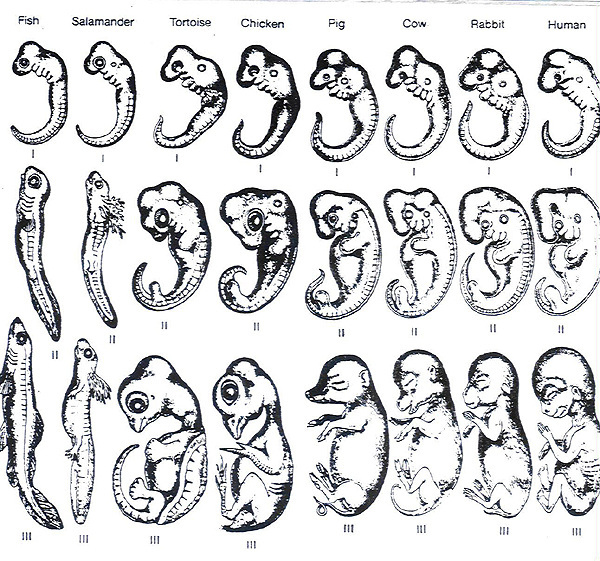 Compare embryos of organisms to showing similarities between species as evidence of common ancestry. 1. What is a cladogram? Explain how it is used. 2. Find the kingdom and phyla for these 3 organisms: chicken, butterfly, sponge. Step 1: Watch the video to the right and then pick up a Comparative Embryology Activity, complete on page 71 of your notebook, follow the direction to cut and paste and then answer the questions that follow. Benchmark with the teacher and then self-assess with the teacher notebook. Step 3: Take the Open Note Natural Selection Quiz 1 and turn into the tray. a. What is a Zygote? d. What is cleavage and what causes it to vary among organisms? e. Which organisms are the mammals and what do you notice about their development? f. What will the ancestral gill slits in mammals eventually become? g. What do mammals have to replace the egg yolks? h. What is the main difference between the monkey and the human fetus? i. What adaptation has the chicken developed in it fetus stage? j. Which organism undergoes metamorphisis? k. What are the gestation periods for each mammal? l. What is responsible for giving organisms a set of instructions for development? Paste your colored Vertebrate Body Sheets onto page 72. 1. 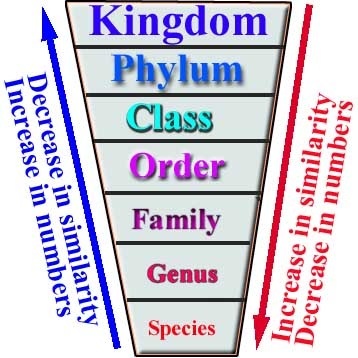 Construct an explanation based on evidence that describes how genetic variations of traits in a population increase some individual's probability of surviving and reproducing in a specific environment. 1. How do adaptations get passed down to offspring? a. What is the recipe for evolution? b. What are the causes of variation? Step 2: Complete the DNA Isolation Lab and answer the questions on page 75. 2. Where is DNA found? 3. Why did we use broccoli in this lab? Could we use something else? Does everything have DNA? 4. Why did we use a blender for the broccoli? 5. Explain what the detergent does to the broccoli cells. 6. Explain what the meat tenderizer did to the DNA. Draw out the explanation. 7. What was the purpose of the salt in step one? 8. What is the purpose of the alcohol? 9. Draw the test tube and the layered mixture along with the strands of clumping DNA. 10. What is it called when the DNA is undissolved in the alcohol? 1. Investigate how scientists classify living things. 2. Research and classify your own living organism. Step 1: Pick up Activity 11 (or 12 if you completed the DNA Isolation lab) and Watch the video The Classification of Living Things to answer the questions. Step 2: On the back of this sheet is an example of a taxonomy foldable. You will be assigned an organism that you will be dissecting and you will need to complete this taxonomy foldable for your organisms. The rubric is attached at the bottom. You will need to grab a construction sheet of paper and complete for your next grade. 1. 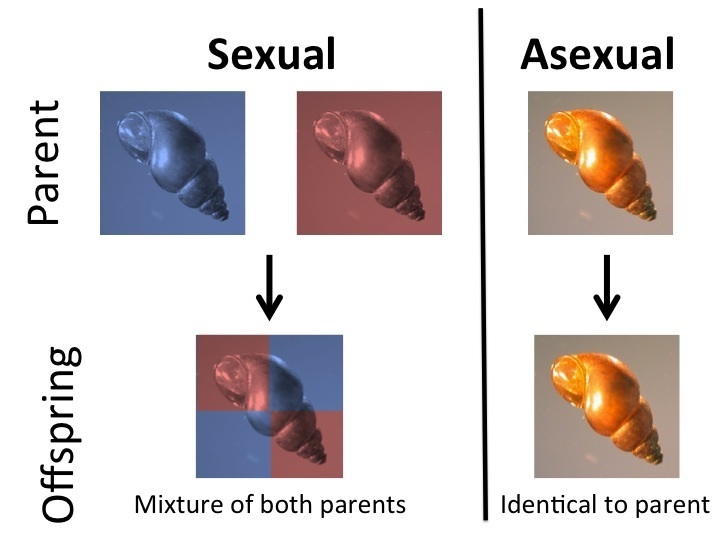 Develop and use models to describe why asexual reproduction results in offspring with identical genetic information and sexual reproduction results in offspring with genetic variation. 1. What is the difference between sexual reproduction and asexual reproduction? 2. Which type of reproduction allows for the most genetic variation in offspring? Why? Step 1: Click on the link above for Sexual v/s Asexual Reproduction. Make a T chart in your notebooks on page 75 with the headings: Sexual Reproduction and Asexual Reproduction. List all the animals that you click on under the correct heading. *. Answer the questions on page 76 in your notebooks.